The default signature to add to email. You can use <company> to insert the licensed company name automatically. If the user is set to have customized signatures then the additional fields can be replaced for the users: <usercustom> - the text between this tag and the end tag (</usercustom>) will be removed if the user does not have custom signatures set <usercustomsig> - the customized signature for the user in text/html. If this is included it will be replaced by the text/html pieces specified for the user. If it is not included the entire signature will be replaced. <title> - the title specified for the user <email> - the user email address <usercompany> - the company specified for the user <department> - the department specified for the user <phone> - the phone specified for the user <mobile> - the mobile/cellular phone number specified for the user <cell> - the mobile/cellular phone number specified for the user <office>- the office specified for the user <other>- the additional data specified for the user This signature is a text signature that is added to text based email. If you do not specify an HTML signature, the text signature will be automatically converted to HTML and used in any HTML email requiring a signature. Example: The information contained in this message is for the intended addressee only. If you are not the intended addressee, please delete this message and notify the sender; do not copy or distribute this message or disclose its contents to anyone. The default signature to add to email. You can use <company> to insert the licensed company name automatically. This signature is an HTML signature that is added to HTML email. 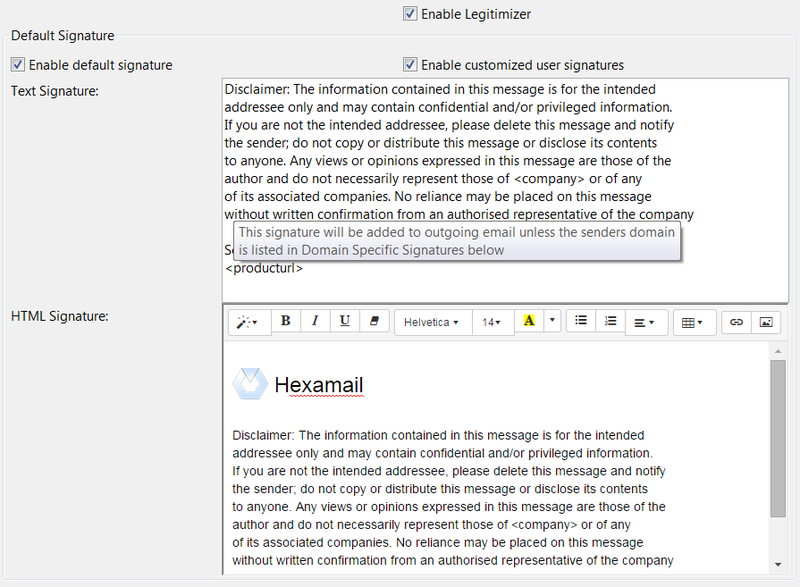 If you do not specify an Text signature, the HTML signature will be automatically converted to text and used in any text email requiring a signature. Check the email directions you wish to match. Inbound means email sent from an external domain to one of your specified domains (see SMTP Server). Outbound is to an external domain from your domain, and relay is from an exteranl domain to another external domain (if this is allowed with your server). This setting applies to all signature processing rules.